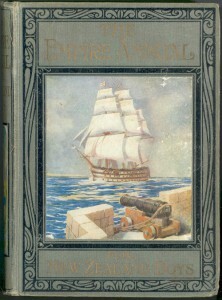 The purpose of this work is two fold: first, to assess the role played by boys’ story papers in the Edwardian era in creating an imperial brotherhood of young readers between Britain and the Dominions; and secondly, to examine the techniques used by authors and publishers to educate readers on the perceived military threat posed by Germany. This, in tandem with reports in the daily press, gained credibility, in particular after 1905. By examining the role of story papers and the methods adopted by publishers in this period, a greater understanding of the level of anti-German sentiment prevalent within British and Dominion societies before 1914 will be realised. The importance of Edwardian boys’ papers for the Empire cannot be overstated. It was one of the ways in which society both inculcated its members on the prevailing ideas and attitudes and brought together those in the white Dominions in an appreciation of British cultural and racial superiority. In this period, New Zealand was subsumed within an imperial ideology, unsurprising given its overwhelmingly British population. The ties between the two were close-knit, to say the least. As one observer noted, ‘Education, reading, prevailing sentiment, economic interest – all turned the New Zealand writer’s thoughts and ambitions towards England; and given the opportunity, it was to England he or she migrated.’5 That these connections were so strong provided magazine publishers with a further market to be pursued. Involving the Empire’s youth in an appreciation of Britain’s imperial traditions and supposed cultural superiority also provided the opportunity for publishers to plunder a new market. The Religious Tract Society (RTS), for example, saw its annual sales income increase from approximately £110,000 in 1870 to over £180,000 in the mid-1880s.9 The reciprocal arrangement between consumers and producers is an interesting one: consumers indicated what they liked by what they bought; in turn, the producers, seeking ever greater profits, responded to their readership’s demand. Providing that the price of magazines was acceptable (in most cases never more than one penny and therefore within the range of many youths), and the material did not stray beyond acceptable boundaries, this was a relationship primed for mutual advantage. As John MacKenzie has argued, the imperial principles that underpinned many adult authors’ works were reshaped to capture the imagination of juvenile readers.10 In the late nineteenth and early twentieth centuries these settings were in far-flung corners of Africa and Asia, but by 1905 these tales took on a more Eurocentric feel with Germany increasingly portrayed as the central protagonist. Publishers and the authors they contracted to supply stories expressed concern about the future of the Empire, and the threat posed by an increasingly hostile Germany. Both of these elements were already a feature of adult literature and, by 1906, appeared on an almost daily basis in newspaper copy. It should be no surprise therefore that proprietors of daily newspapers such as Lord Northcliffe should introduce increasingly widespread concerns about Britain’s domestic and imperial future into juvenile publications operated through his Amalgamated Press.11 Throughout the late-Victoria era, newspaper circulation in Britain had increased due to advances in telegraphy and the mass printing press, a rise in population, increased standard of living, and an expansion of primary education leading to a steady growth in literacy.12 Thus, it was a natural response during this period that publishers should reach out to a younger, and to that point, untapped market. 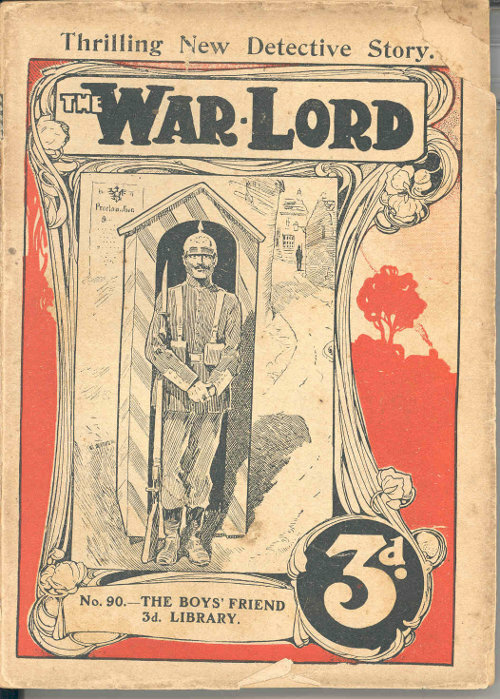 Nearly all juvenile literature available prior to the Great War was published in Britain, with editions specifically for the Dominions of New Zealand, Australia and Canada. Providing a further link with the Mother Country, the boys’ papers aimed at those in the Dominions intended to ‘make Britons of them’. All the necessary attributes required to be a loyal son or daughter of the Empire could be achieved by filling the pages with tales of imperial derring-do. The role of the Empire loomed large in boys’ story papers, both those for domestic consumption and those set aside for the Dominions. 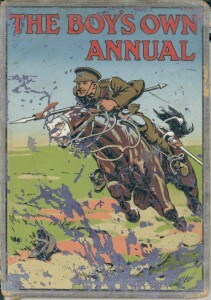 Going by unimaginative titles such as New Zealand Boy’s Annual, Australian Boy’s Annual and Empire Annual for Boys, these works contained many of the same stories and authors prevalent in British magazines.13 There was clearly a reciprocal arrangement at work: those living in Canada, Australia and New Zealand would learn the virtues of any good imperial subject (honour, duty, sacrifice), while those in Britain would learn of the diversity and vastness of an Empire established in their name. In New Zealand, colonial settlement and furthering knowledge of Māori customs were regular features. For some youngsters, letters in the ‘Correspondence’ section of periodicals also played a significant role in strengthening ties with Britain. One such correspondent, S. Pearson, who referred to himself as an ‘Old Colonial Boy’, noted that he had petitioned the Wellington Library Committee so the BOP monthly parts ‘should be regularly placed on reading-room tables, particularly for the benefit of poorer boys.’ He continued that this had been successful as the Newtown Free reading-rooms and other reading rooms of the colony were now supplied with copies.14 For this ‘Old Colonial Boy’, access to juvenile magazines appeared to provide an important mode of maintaining New Zealand’s close relationship with Britain. Accounts of reading culture in this period stress the kinds of publications in which a juvenile code of honour, chivalry and loyalty was established. Adult fiction and fiction for children were connected by an approval for imperial manliness and citizenship; but children’s literature of the type considered here concentrated specifically on the essentials of making a constant and loyal child into a good citizen, and later, soldier of Empire. Despite the apparent abstractions of such a process, adults remembered it well when they looked back to their childhood. Frederick Willis, author of Peace and Dripping Toast, recalled with great fondness that ‘we thought British people were the salt of the earth … the object of our education was to train us to become honest, God-fearing, useful workmen, and I have no complaints against this very sensible arrangement.’15 If this was the reaction by Britain’s youth there is reason to believe that the same effect was present elsewhere in the Dominions. As the nineteenth century gave way to the twentieth, the BOP adhered to the themes established in its infancy: honour, fair play, decency, restraint, and patriotism. As the Great War drew closer these very attributes were contrasted with German aggression, underhandedness and dishonour. That all these fine qualities were embedded in adventure stories set in Britain’s Grammar and Public Schools, or in exotic overseas locations, made them far more appealing to impressionable British and imperial youth. 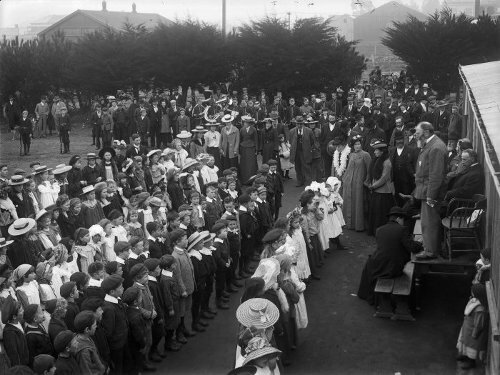 The calibre of the writers clearly shows the importance placed on ‘penny weeklies’ for children.27 The writers themselves realised the value their stories were having on the minds of the young to the point that Doyle felt ‘obliged’ to enlist as a medical doctor in the Boer War in 1900 on the strength of his story telling. As he explained to his mother, ‘I have perhaps the strongest influence over young men, especially young athletic sporting men, of anyone in England (bar [Rudyard] Kipling). That being so, it is really important that I should give them the lead.’28 That Doyle was aware of this influence is testament that literacy among the young had reached significant levels. That being so, those committing to story papers’ tales of heroism, adventure and espionage were in a position of some authority and as such magazine proprietors were able to attract the best writers in Britain. founder of the Empire Day Movement, urged the Empire’s youth to ‘excel in the practice of Faith, Courage, Duty [and] Self-discipline’, thus ‘strengthening the British Empire, and consolidating the British Race’.34 It is clear from Meath’s message that Empire Day was concerned with strengthening imperial ties; making the Dominions aware of their British heritage and emphasising both their present and future roles for the maintenance of the Empire, whether in good times or bad. Again, the rhetoric of mothers and sons comes through Meath’s message. Britain, the ‘mother’ was viewed as the provider, the protector, and in this instance the educator. It was Britain’s purpose to keep the Dominions informed of changing attitudes at home so that they, as loyal children, could follow suit accordingly. As such, the role of the Dominions’ youth was pivotal to the success of this indoctrination. In many cases, stories and features, which appeared in children’s literature mirrored concerns and anxieties reported in daily newspapers across Britain and the Empire. The key event which ignited British enmity towards Germany was the latter’s push for naval parity in the wake of the Anglo-French signing of the Entente Cordiale in April 1904. From this point onwards it was evident that in the not too distant future Britain and Germany would settle their differences on the high seas and the battlefield. Juvenile magazines, like daily newspapers, were reacting to these changes in the international arena. BOP, Chums, The Gem, The Magnet, The Captain, and Empire Annual for Boys not only played a pivotal role in keeping British and imperial youth informed of such developments, but in many instances published fictitious stories which portrayed a future European war in which Britain would be victorious. From 1910 onwards there was a discernible shift in the tone of many juvenile magazines within Britain and the Dominions. The staples of travel, quest and adventure remained but they were joined by tales of male comradeship, heroism, and courage in the face of danger, in some cases courage leading to death. Plots in these stories followed a profoundly moral pattern: evil, well-armed Germans, intent on the subjugation of Britain and her Dominions by foul means, were defeated at the eleventh hour by a brave but ill-prepared Briton who achieved this by displaying all the virtues of amateurism instilled during his days at public school. In the Edwardian era making clear the distinctions between Britons and Germans, whether in duty, honour, chivalry, or a sense of fair mindedness, helped justify, to some degree, the publication of derogatory stories, which became increasingly common in the years leading up to the war. To this end, they contributed to a wartime belief that Germans, despite sharing cultural, dynastic and racial similarities to Britons, were indeed, a breed apart. Collingwood’s tale built upon increasingly common fears and anxieties that Germans were ready to invade Britain at any given moment, adding to the distrust already felt towards Germans resident in Britain.51 In terms of its martial implications it reinforced the idea that naval defences were crucial to British, and therefore, imperial security. Stories such as Collingwood’s were interspersed with more factual articles concerning Britain’s naval expenditure such as those put forward by F.S. Hartnell.52 These stories were a way of justifying what was spent and where, and keeping in the public arena the threat enemy powers were likely to pose. This all-consuming militarism was a key feature in the telling of many children’s stories. While Pulbrook’s observations grossly exaggerated the martial propensities of the German State and the hold it had over Germany’s youth, stories such as this nevertheless attempted to establish in the minds of Britain’s readers German potential for underhand activities in order to steal a march on Britain in the event of conflict between the two. What transpires is that the German ‘spy’ is no more than an actor researching a role for the local amateur dramatics society; nevertheless, the story served its purpose: a German official behaving in an underhand way while a guest in Britain, and daring to talk of the next war, was yet another example of German military might attempting to steal a march on fair and decent Britons. With the benefit of hindsight it seems incredible that in the Edwardian era fictitious wars between Britain and European powers were being constructed within the pages of juvenile literature. War, of course, has always been the inspiration for many a ripping yarn, and along with colonial expansion, was the vehicle through which British superiority (either racial or martial) could be expressed. 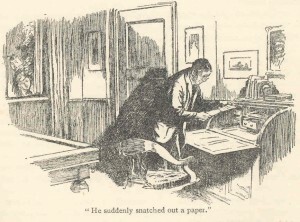 This premise provided the starting point for authors such as ‘Captain’ Frank Shaw and Harry Collingwood, who were both regular contributors to boys’ magazines. In the context of the Great War this tale makes startling reading. Conflict between Britons and Europeans was nothing new, but imperial differences were usually settled in far-flung corners of the Empire, not in European waters. That this story predicted, even relished, a war between Britain and European powers, a war that would threaten British domestic security, marked a significant change in how authors were reflecting shifts in international relations. 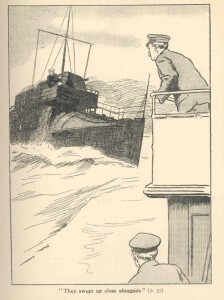 Shaw cut his teeth in the Edwardian era and later proved to be a first-rate recruiting agent and propagandist after August 1914.59 In this tale he recognised that British predominance of the oceans was under threat, yet this threat would be met with expected British resolve: ‘never before, during two centuries, had a hostile fleet crept so near to the shores of England. It was an insult that must be wiped out in blood.’60 However, to remain within the traditions of boy’s own adventures, the hero of the piece, 18 year-old (and therefore a near contemporary of many readers) Hal Grenville, urged his colleagues to ‘fight as they fought in Nelson’s day’, which involved pulling his ship alongside Dutch and Russian vessels, boarding them and defeating the enemy in hand-to-hand combat. At this the representative is thrown from Alf’s house. A witness to this remarkable scene is Sexton Blake himself, en route to visit a friend. When he mentions the scene to his friend, Dr. Phelps, he is told that Beaumont is ‘a tremendously clever fellow with lots of character and a fine disposition. And if he had got a good opening and a first-class education as a lad, he would make a great name for himself.’62 The point here is clear that Beaumont, despite a lack of education (which presumably renders him free of ambition) and living in working-class London, is still imbued with a British sense of loyalty and dignity; selling his product would undoubtedly improve the lot of his family but the notion of selling to Germany, a potential enemy, is unthinkable. 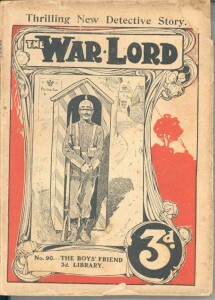 The Kaiser also features in another of the Boys’ Friend Library series, ‘The War-Lord’, written by ‘Detective Inspector’ Coles. ‘The War-Lord’, like so many other stories, is set against the backdrop of deteriorating diplomatic relations between Britain and Germany. 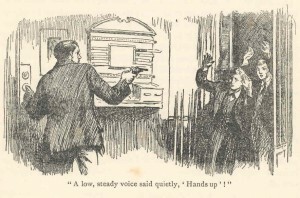 Two boy detectives, Bob Dawson and Harry Fairfax, become suspicious of the activities of Sir Hamil Brender, millionaire ship-owner and Member of Parliament. That Brender is a German-born British national is of interest to the boys, even more so after he is seen associating with German foreign ministry officials. In a war between Britain and Germany his loyalty, they argue, would be open to question and the land of his birth would take precedence. While promoting himself as ‘the friend of labour, the upholder and the champion of the working man, the staunch supporter of Radicalism’, Brender plots Britain’s overthrow from within.64 Being at the heart of Government, Brender is in a position to act on behalf of Germany, and this he does. His task is to lead the Cabinet in mobilising the fleet towards Dover and Portsmouth; once there they would provide targets for Zeppelins that would destroy the Royal Navy in one well-executed raid. That the Kaiser is aware of this fiendish plot is crucial to the account. ‘The war lord’ by Det. Insp. Coles. The abundance of exclamation marks in the text suggests an excitable, volatile and emotional character at work, which remains in direct contrast to the British disposition: calm, sanguine and not given to fanatical ranting. This passage also highlights an opinion that in the years prior to the war the British Government was indecisive concerning its attitude toward Germany.68 The reader is provided not only with a figure to despise for his treachery, but also has brought to his or her attention the intransigence of the state to prepare itself and its people for a conflict which seemed imminent. Having the Kaiser as a central actor in these stories not only establishes in the mind of the reader the pervasiveness of German underhandedness from the naval rating to the nation’s leader, but also demonstrates that the Kaiser was such a recognisable figure in Britain and the Dominions at this time. No other German figure encapsulated better the martial traditions of Germany: he was never depicted, either in photograph or cartoon, in civilian dress, but always resplendent in full military regalia. To this degree he personified the image of Prussian militarism required by propagandists before and during the war through which the people could vent their disgust. In John Tregellis’s ‘The Secret of the Thames’, invasion of Britain across the North Sea is again a focus. The hero of the piece, Hervey Milton, is an amateur sailor and employee of the War Office. The story opens with Hervey tackling a difficult entrance to the mouth of the Thames. He explains to his comrade that the Thames estuary holds notorious sands and banks that are mostly undetectable, even in daylight. Having succeeded, he moors his yacht and arrives at the War Office where he is asked his advice on the Thames’ defences. The story concludes with the invaders being repelled, forced back to Germany. Milton, the hero of the hour, receives the thanks of a grateful nation by receiving the title, Lord Faversham (incidentally an area of Kent overrun by the Germans), and an endowment of £200,000.75 The moral of ‘The Secret of the Thames’ is clear: a failure of British military and political planners to ready Britain for war was certain to result in disastrous consequences. Not only was Britain’s enemy prepared for invasion it was more than capable of carrying it out. The ‘feeling of manly self-reliance which caused Australia to bestir herself’ derived from its development from dependent colony to mature contributor to Britain’s imperial defences. As such, it provided an essential outlet for stories representing masculine prowess in a war situation. Much of this rhetoric, of course, was concerned with preparing young men for armed conflict. Just as the establishment of boy and girl scouts movements encouraged outdoor pursuits which promoted health and fitness, and just as Kitchener and French’s visits to the Dominions had outlined the future role of cadet forces, so too was the editor of BOP involved in promoting juvenile fitness. This was used as a means of instilling discipline and camaraderie that to this point had been lacking in British society; a discipline and awareness that would be invaluable on the battlefield. Juvenile literature in the form of boys’ story papers for British and Empire youth provides one explanation for the speed with which society mobilised against Germany so soon after the declaration of war in August 1914. Whether the Edwardian era can be classed as one which actively promoted systematic Germanophobia is open to interpretation, yet, an entire generation of boys, who by 1914 were of military service age, had grown up reading xenophobic (in particular anti-German) stories. It is also clear from ‘boy’s own’ literature that Britain experienced rapid changes in its perceived primacy in world affairs, and the insecurities which were felt by this underpinned much literature, juvenile as well as adult. Louis Bleriot’s successful crossing of the English Channel immediately negated British naval superiority, which it had enjoyed since the Napoleonic Wars. Through the pages of boys’ papers campaigns were mounted to inform and educate British and Empire youth on the worsening European situation. The need to legitimise army and naval expenditure to youngsters mirrored Lord Northcliffe’s own policy of agitating for action at government level, which he conducted regularly in his daily newspapers. British unpreparedness for war, combined with knowledge of German strength, provided a potent mixture. Through the pages of children’s literature an easily detectable suspicion of Germany rose in the wake of the Boer War. The signing of the Entente Cordiale with Britain’s traditional enemy, France, in 1904, shifted British embedded fear of the foreigner to Germany, Britain’s traditional ally. Over the next decade a methodical demonisation of Germans, especially those engaged in the vile practices of spying for military gain, took place. Posing as schoolmasters, dockyard workers or holidaymakers, every German was given overtly Prussian characteristics; be they in name, a Kaiser-like moustache, a love of militarism, or a profound sense of professional efficiency. These characteristics were juxtaposed against traditional British values of amateurism, fair play and honour, as instilled through the public school system. While it is impossible to gauge the influence boys’ story papers had on the hearts, minds and pockets of their readers, assumptions can be made. For almost a century they were the established form of entertainment for millions of children within Britain and the Empire. For this reason alone their importance cannot be dismissed. The vast array of titles meant that all tastes were covered. They were easily purchased and traded, and, within the Correspondence pages of various titles, a relationship was established between publishers and readers. Their ability to respond immediately to a deteriorating European situation meant that boys’ story papers were a useful tool in informing and preparing young minds for future conflict. Likewise, their increasingly negative portrayal of foreigners (in particular Germans) provides a unique source in understanding the speed with which society mobilised against Germany in August 1914. 1: France effectively disappeared as Britain’s foe in juvenile literature after the signing of the Entente Cordiale in August 1904..
2: David Goodwin, ‘A Lancashire Lad’, Boys’ Friend Library, no.69, c.1909. 3:Ernest C. Pulbrook, ‘The German Schoolboy’ in Boy’s Own Paper, 27 January 1906, pp.266-267. 4:Stella Yarrow, ‘The Impact of Hostility on Germans in Britain, 1914-1918’ in Immigrants and Minorities, vol. 8, March 1989, nos 1 and 2, pp.97-112. 5:E.H. McCormick quoted in Keith Sinclair, A Destiny Apart: New Zealand’s search for national identity, Wellington, 1986, p.95. 6:Boyd, Manliness and the Boys’ Story Paper in Britain, pp.1-2. 7:See Kathryn Castle, Britannia’s Children: Reading colonialism through children’s books and magazines, Manchester, 1996; Cecil Eby, The Road to Armageddon: The martial spirit in English popular literature, 1870-1914, Durham, 1988; Peter Hunt (ed), Children’s Literature: An illustrated history, Oxford, 1995; Jeffrey Richards (ed), Imperialism and Juvenile Literature, Manchester, 1989. 8:John Buchan quoted in Martyn Lyons and Lucy Taksa, Australian Readers Remember: An oral history of reading 1890-1930, Melbourne, 1992, p.43. 9:Aileen Fyfe, ‘Societies as Publishers: The Religious Tract Society in the mid-nineteenth century’ in Publishing History, vol.58, 2005, p.11. 10:John M MacKenzie, foreword in Jeffrey Richards (Ed), Imperialism and Juvenile Literature, p.1. 11:The Boys’ Friend Library series was one of at least fifteen being published by the Amalgamated Press in the Edwardian era; See Kelly Boyd, Manliness and the Boys’ Story Paper in Britain: A cultural history, 1855-1940, Basingstoke, 2003, pp.224-225. 12:Paul Kennedy, The Rise of the Anglo-German Antagonism 1860-1914, George Allen & Unwin, 1980, p.376. For an in-depth study of the role of the Imperial press in this era see Simon Potter, News and the British World: The emergence of an imperial press system, 1876-1922, Oxford, 2003. 13:This is unsurprising given the Australian Boy’s Annual, for example, was published by Cassell, whose main printing house was in London. 14:Boy’s Own Paper, 18 November 1905, p.111. 15:Frederick Willis in Jonathan Rose, The Intellectual Life of the British Working Classes, New Haven 2001, p.323. Willis’s Peace and Dripping Toast explores English social life and customs in the 1890s; Phoenix House, London, 1950. 16:In New Zealand, the average age of men enlisting on the outbreak of war was 23; Paul Baker, King and Country Call: New Zealanders, conscription and the Great War, Auckland, 1988, p. 15. 17:David Stafford, ‘Spies and Gentlemen: The birth of the British spy novel, 1893-1914’, in Victorian Studies, vol 24 (4), 1981, p.495. 18:Erskine Childers, The Riddle of the Sands: A Record of Secret Service Recently Achieved, London, 1903. Also see William Le Queux’s The Great War in England in 1897(1894), England’s Peril (1899) and Spies of the Kaiser (1909). 19:The Sandon Act (1876) established school attendance committees and made it a legal obligation for parents to educate their children. The Mundella Act (1880) introduced compulsory education for the under-tens, W.H.G. Armytage, Four Hundred Years of English Education, Cambridge, 1964, pp.149-150. 21:See Aileen Fyfe, ‘Societies as Publishers’ for an account of the RTS’s role in British society. 22:Crotty, Making the Australian Male, p.135; Patrick A. Dunae, ‘Boys’ Literature and the Idea of Empire, 1870-1914’, in Victorian Studies, vol 24 (1), 1980, pp.107-108. 23:Julia Briggs and Dennis Butts, ‘The Emergence of Form (1850-1890)’ in Peter Hunt (ed), Children’s Literature: An illustrated history, p.163; John M. MacKenzie, Propaganda and Empire: The Manipulation of British Public Opinion, 1880-1960, Manchester, 1984, p.203. 24:Peter Parker, The Old Lie: The Great War and the Public School ethos, London, 1987, p.127. 25:Sexton Blake’s able assistant was Tinker, a working-class Cockney. 26:Martyn Lyons and Lucy Taksa, Australian Readers Remember: An oral history of reading 1890-1930, Melbourne, 1992, p.44. 27:Henty’s sales have been estimated at 25 million, Crotty, p.134. 28:Parker, The Old Lie, p.130. 29:Paul Kennedy, The Realities behind Diplomacy: Background influences on British external policy, 1865-1980, London, 1981, p.116. 30:MacKenzie, Propaganda and Empire, 1984, p.204. 31:Australia supplied 16,632 troops, Canada 7,368 and New Zealand 6343; John Crawford and Ian McGibbon (eds), One Flag, One Queen, One Tongue: New Zealand, the British Empire and the South African War, 1899-1902, Auckland, 2003, p.59. 32:Michael King, The Penguin History of New Zealand, Auckland, 2003, p.285. 33:King, The Penguin History of New Zealand, p.288. 34:School Journal, Part III for Classes V and VI, Vol. II, no.4, May 1908, New Zealand Education Department, Wellington, pp.115-116. 35:T.Cheyne Farnie, ‘The Maintenance of the Supremacy of the British Empire at Sea’, a Christchurch Navy League publication, Christchurch, New Zealand, 1907, p.9. 36:Also see The Times (London), 6 March 1908, p.11; 21 August 1908, p.9; 5 April 1911, p.9. 37:For Boer War histories see Thomas Pakenham, The Boer War, London, 1979, Denis Judd and Keith Surridge, The Boer War,London, 2003, John Crawford and Ian McGibbon (eds), One Flag, One Queen, One Tongue: New Zealand, the British Empire and the South African War, 1899-1902, Auckland, 2003. 38:Kennedy, The Realities behind Diplomacy, pp.123-124. 39:‘German Naval Expenditure’, The Times (London), 29 January 1910, p.9; ‘Naval Estimates for 1914’, The Times (London), 22 January 1914, p.7. 40:Hamilton Fyfe, Northcliffe: An intimate biography, New York, 1930, p.149. 41:Parker, The Old Lie, p.126. 42:Edward Owen, 1914: Glory Departing, London, 1986, p.127. 43:’Aerial Defence: The urgency of the problem’, Major B. Baden-Powell, letter to the editor, The Times (London), 27 February 1913, p.6. 44:Northcliffe had been an active supporter of a strong navy for domestic and imperial defence since the 1890s, Reginald Pound and Geoffrey Harmsworth, Northcliffe, London, 1959, p.153. 45:Boy’s Own Paper, 26 February 1910, pp.346-347. 46:Boy’s Own Paper, 6 October 1906, p.14. 47:Boy’s Own Paper, 6 October 1906, p.14. 51:Panikos Panayi, The Enemy in Our Midst: Germans in Britain during the First World War, Oxford, 1991, pp.32-41. 52:F.S. Hartnell, ‘His Majesty’s Navy: Dominions helping the Mother Country’ in Australian Boy’s Annual, 1911, pp.22-25. 53:Boy’s Own Paper, 21 October 1905, pp.39-40. 54:Boy’s Own Paper, 21 October 1905, pp.39-40. 55:Ernest C. Pulbrook, ‘The German Schoolboy’ in Boy’s Own Paper, 27 January 1906, pp.266-267. 56:Empire Annual for New Zealand Boys, no year, no volume number, pp.150-161. The emphasis here is my own. 57:Empire Annual for New Zealand Boys, no year, no volume number pp.150-161. 58:Chums, 8 January 1908, p.430. 59:Shaw penned a direct and patriotic appeal to British and Imperial youth to enlist in the Royal Flying Corps, Chums, 5 June 1915. 60:Chums, 8 January 1908, p.431. 61:‘A Woolwich Arsenal Mystery: A Tale of Sexton Blake’, The Boys’ Friend 3d. Library, issue 27, London, October 1907, p.5. The author is anonymous though ‘Blakiana: The Sexton Blake Resource’ cites E.J. Gannon as the author. The Blakiana site also provides the date of publication as this is not printed on any Boys’ Friend Library issues. 62:‘A Woolwich Arsenal Mystery: A Tale of Sexton Blake’, p.8. 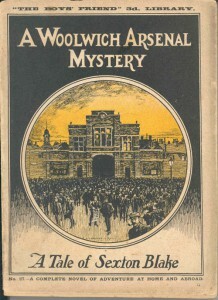 63:‘A Woolwich Arsenal Mystery: A Tale of Sexton Blake’, p.120. 64:Det. Insp. Coles, ‘The War-Lord: A tale of the German naval programme and how it was defeated by Bob and Harry, the boy detectives’, The Boys’ Friend 3d. Library, issue 90, London, 19-?, p.72. 68:For an in-depth analysis of Victorian and Edwardian diplomatic relations between these two states see Paul Kennedy, Rise of the Anglo-German Antagonism, 1860-1914, London, 1980. Also see John Ramsden’s Don’t Mention the War: The British and the Germans since 1890, London, 2006. 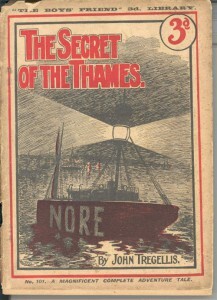 70:John Tregellis, ‘The Secret of the Thames’, The Boys’ Friend 3d. Library, issue 101, London, 19-? 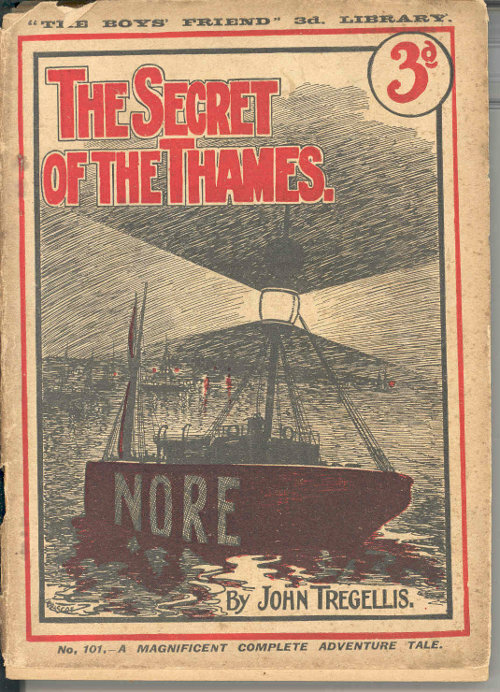 71:Tregellis, ‘The Secret of the Thames’, p.99. 72:Tregellis, ‘The Secret of the Thames’, p.99. 73:Tregellis, ‘The Secret of the Thames’, p.99. 74:Tregellis, ‘The Secret of the Thames’, p.106. 75:Tregellis, ‘The Secret of the Thames’, p.106. 76:Australian Boy’s Annual, 1911, pp.22-25. 77:Australian Boy’s Annual, 1911, pp.22-25. 78:Australian Boy’s Annual, 1911, pp.104-105. 79:W. David McIntyre, ‘Imperialism and Nationalism’ in Geoffrey Rice (ed), Oxford History of New Zealand, Auckland, 2000, p.343. 80:New Zealand Free Lance, 19 February 1910, p.2. 81:Australian Boy’s Annual, 1911, p.106. General Sir John French became Commander-in-Chief of the British Expeditionary Force in France in 1914. 82:Boy’s Own Paper, August 1914, p.41. 83:Boy’s Own Paper, August 1914, p.41. 84:Boy’s Own Paper, August 1914, p.41. 85:Boy’s Own Paper, August 1914, p.41. 86:See G.A. Henty, Young Colonists: A story of the Zulu and Boer Wars, London, 1898, and Rudyard Kipling, Soldiers Three, London, 1895. 87:Shaw’s ‘Join the Royal Flying Corps!’ was an impassioned plea for men of service age, not yet in uniform, to enlist in the newly formed Corps; Chums, 5 June 1915. 88:My Magazine, vol. 9, no.56, October 1914. This plea was printed as a flyer and placed loose leafed inside the front cover. Australian Boy’s Annual, 1910, 1911, 1912. Chatterbox, 1910, 1911, 1913, 1914. Empire Annual for Boys, volume 16. Empire Annual for New Zealand Boys, no volume numbers, no dates. Empire Annual for New Zealand Girls, 1909. Girl’s Own Paper, 1910, 1911, 1912, 1913, 1914. 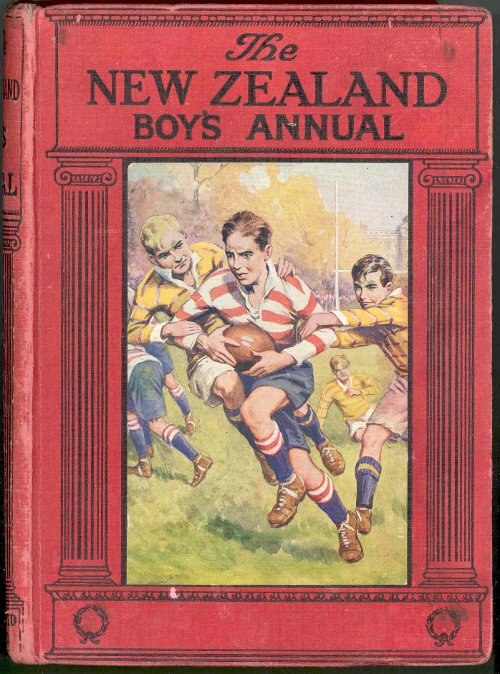 New Zealand Boy’s Annual, no volume number, no date. New Zealand Free Lance, 1910. New Zealand School Journal, 1908, 1911, 1913, 1914. Recently Achieved, London, 1903 (1952). Doyle, Arthur Conan, A Study in Scarlet, London, 1887 (1975). Hope, Anthony, The Prisoner of Zenda, London, 1894 (1961). Hope, Anthony, Rupert of Hentzau, London, 1898 (1963). Le Queux, William, Spies of the Kaiser, London, 1909. Le Queux, William, The Invasion of 1910, London, 1909. Baker, Paul, King and Country Call: New Zealanders, conscription and the Great War, Auckland, 1988. Boyd, Kelly, Manliness and the Boys’ Story Paper in Britain: A cultural history, 1855-1940, Basingstoke, 2003. Castle, Kathryn, Britannia’s Children: Reading colonialism through children’s books and magazines, Manchester, 1996. Crawford, John and Ian McGibbon (eds), One Flag, One Queen, One Tongue: New Zealand, the British Empire and the South African War, 1899-1902, Auckland, 2003. Crotty, Martin, Making the Australian Male: Middle class masculinity 1870-1920, Melbourne, 2001. Eby, Cecil D, The Road to Armageddon: The martial spirit in English popular literature 1870-1914, Durham, 1987. Fyfe, Hamilton, Northcliffe: An intimate biography, New York, 1930. Hunt, Peter (ed), Children’s Literature: An illustrated history, Oxford, 1995. Judd, Denis and Keith Surridge, The Boer War, London, 2003. Kennedy, Paul, The Realities behind Diplomacy: Background influences on British external policy, 1865-1980, London, 1981. Kennedy, Paul, The Rise of the Anglo-German Antagonism, 1960-1914, London, 1980. Lyons, Martyn and Lucy Taksa, Australian Readers Remember: An oral history of reading 1890-1930, Melbourne, 1992. MacKenzie, John M. (ed), Imperialism and Popular Culture, Manchester, 1986. MacKenzie, John M., Propaganda and Empire: The manipulation of British public opinion, 1880-1960, Manchester, 1984. McCormick, Donald & Katy Fletcher, Spy Fiction: A connoisseur’s guide, Oxford, 1990. Owen, Edward, 1914: Glory Departing, London, 1986. Pakenham, Thomas, The Boer War, London, 1979. Panayi, Panikos, The Enemy in Our Midst: Germans in Britain during the First World War, Oxford, 1991. Parker, Peter, The Old Lie: The Great War and the public school ethos, London, 1987. Potter, Simon, News and the British World: The emergence of an imperial press system, 1876-1922, Oxford, 2003. Pound, Reginald and Geoffrey Harmsworth, Northcliffe, London, 1959. Pugsley, Christopher et al, Scars on the Heart: Two centuries of New Zealanders at War, Auckland, 1996. Ramsden, John, Don’t Mention the War: The British and the Germans since 1890, London, 2006. Richards, Jeffrey (ed), Imperialism and Juvenile Literature, Manchester, 1989. Rose, Jonathan, The Intellectual Life of the British Working Classes, New Haven 2001. Sinclair, Keith, A Destiny Apart: New Zealand’s search for national identity, Wellington, 1986. Vincent, David, Literacy and Popular Culture: England 1750-1914, Cambridge, 1989. Warner, Philip (ed), Best of Chums, London, 1978. Dunae, P, ‘Boys’ Literature and the Idea of Empire, 1870-1914’, Victorian Studies, 24, 1, 1980, pp.105-121. French, D, ‘Spy Fever in Britain, 1900-1915’, The Historical Journal, 21, 2, 1978, pp.355-370. Fyfe, A, ‘Societies as Publishers: The Religious Tract Society in the mid-nineteenth century’ in Publishing History, vol.58, 2005, pp.5-41. MacDonald, R.H., ‘Reproducing the Middle-class Boy: From purity to patriotism in the boys’ magazines, 1892-1914’, Journal of Contemporary History, 24, 1989, pp.519-539. Stafford, D, ‘A Moral Tale: Anglo-German relations, 1860-1914’, International History Review, 4, 1982, pp.249-263. Stafford, D, ‘John Buchan’s tales of Espionage: a popular archive of British history’, Canadian Journal of History, 18, 1, 1983, pp.1-21. 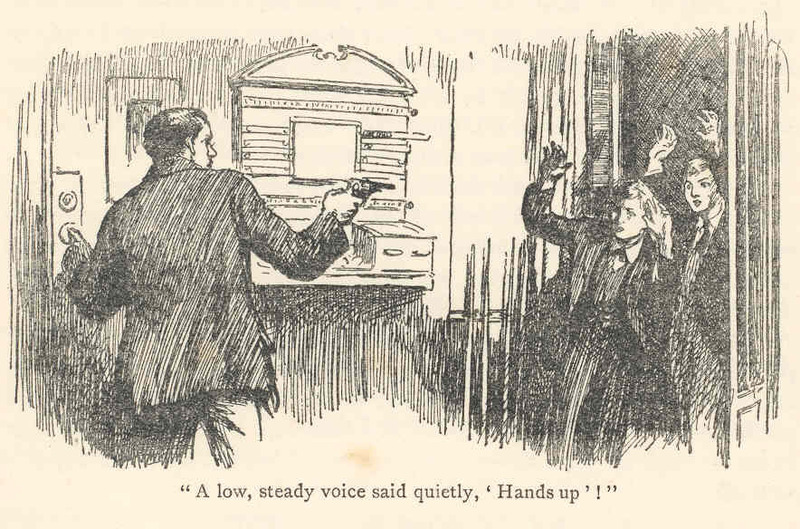 Stafford, D, ‘Spies and Gentlemen: The birth of the British spy novel, 1893-1914’, Victorian Studies, 24, 4, 1981, pp.489-509. Cheyne Farnie, T., ‘The Maintenance of the Supremacy of the British Empire at Sea’ in The Christchurch Navy League, Christchurch, 1907. Papers on the Dorothy Neal White Collection, edited by Audrey Cooper and Margot Crawford. Clare Mallory : a personal memoir, by Janet Maconie. Mrs George Cupples, by Elspeth White. How names became people, by Celia Dunlop. Charles Hamilton and the “All Blacks”, by R. V. Moss. J. H. Ewing and the self-determined child, by Julie K. Eberly. Dorothy Neal White: a tribute. LM, KM, EL, ME & me, KDG: a talk to the Friends of the Dorothy Neal White Collection, by Kate De Goldi. The writings of Elsie J Oxenham : a New Zealand perspective, by Barbara Robertson.